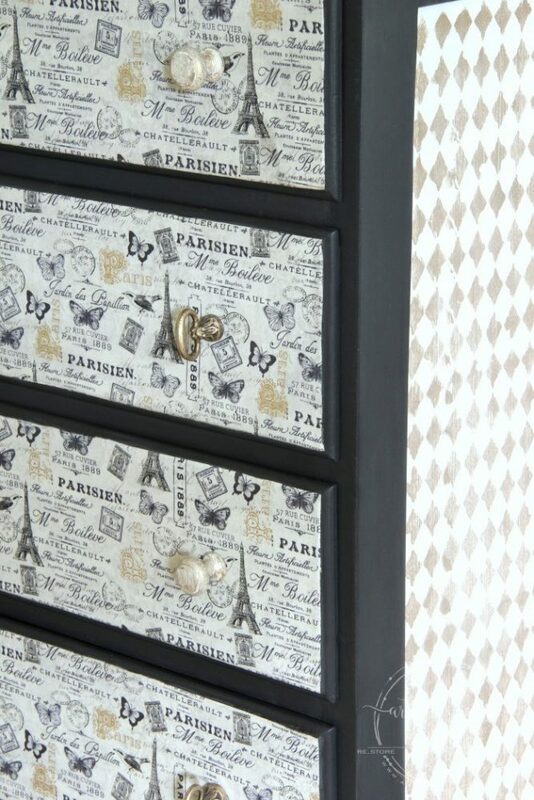 Decoupage is a great way to create a unique finish and and a beautiful designer’s touch to your furniture projects. And the design choices are endless when you use fabric. 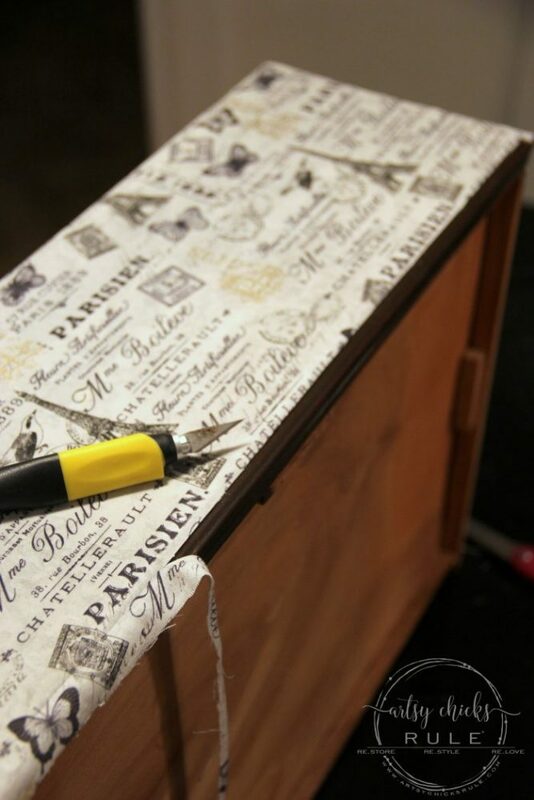 Follow along to see how to in this fabric decoupage tutorial I’m sharing below. 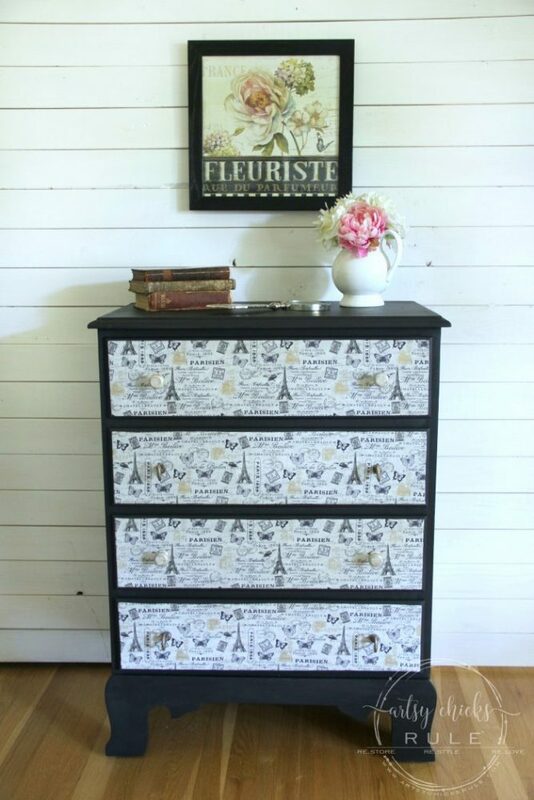 Hey friends, I’m back today sharing a brand new furniture makeover….with fabric decoupage! But FIRST, have you entered the giveaway I’m doing yet?? 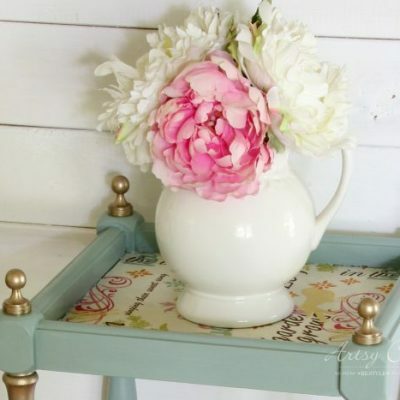 If not, hop on over and see it (and enter it) here, Craft & Decor Giveaway. 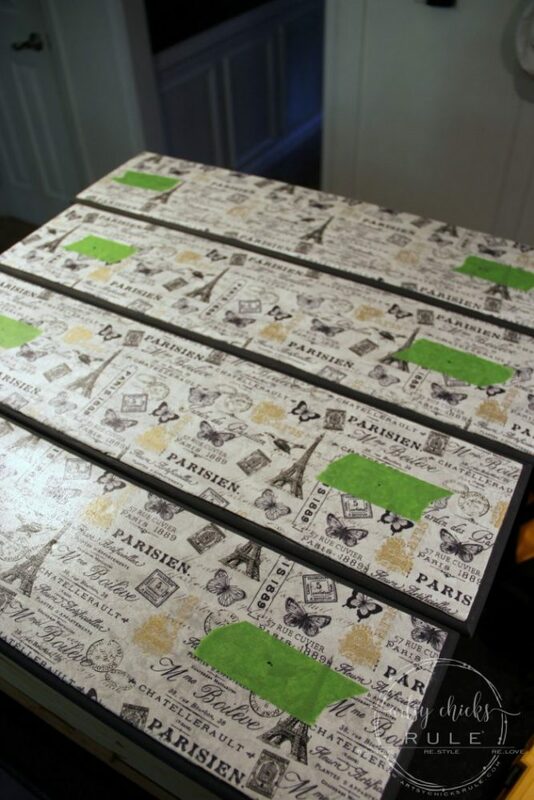 You might remember this little table I gave a bit of fabric decoupage to recently. And hey, if you don’t follow along on Facebook, I’d love if you did! 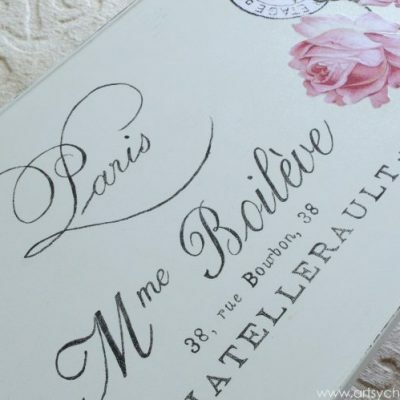 :) I share all kinds of pretty decor related things I come across there. 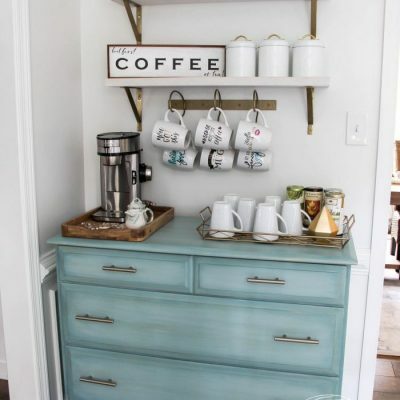 Lots of home decor eye candy and tons of inspiration for your own home too. The top right one with the broken drawer is the one I’m sharing today. The drawer was a pretty easy fix. Thanks hubby! Just needed to be glued back together. All drawers slide nicely and work well now. 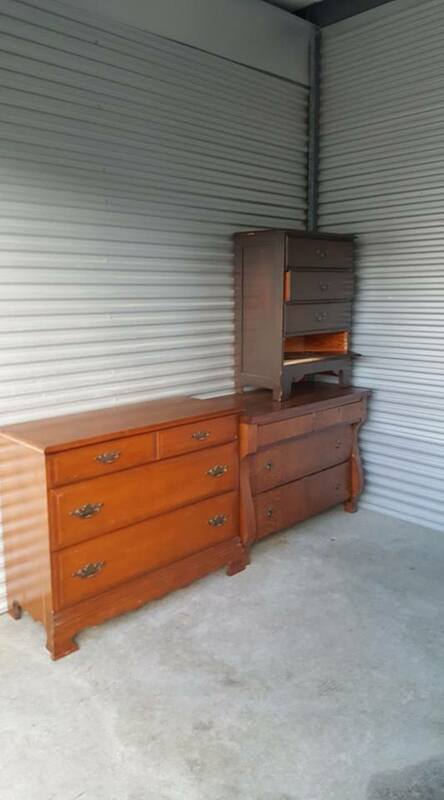 My original idea for this dresser was not quite working out for me. I could not find the fabric I had in my head, anywhere. Darn. 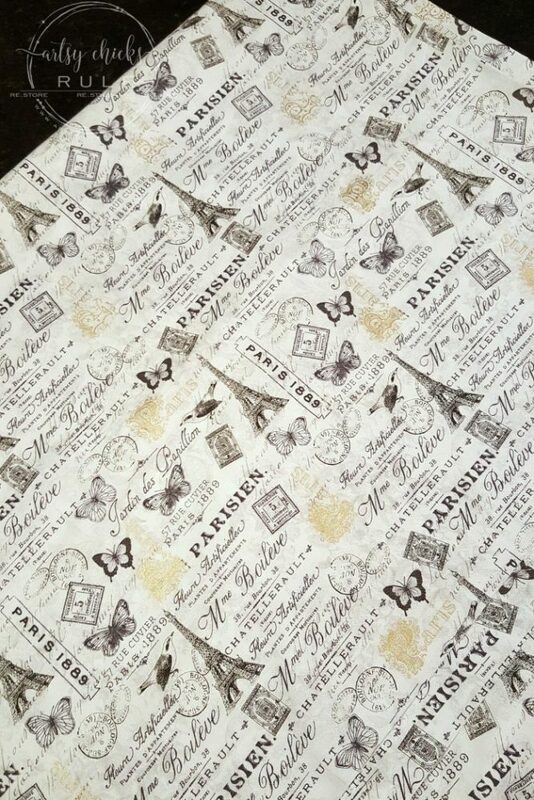 But I came across this gorgeous French fabric (while looking for the other design I was after) and another idea came to me entirely! But …. I haven’t let the other idea go yet. 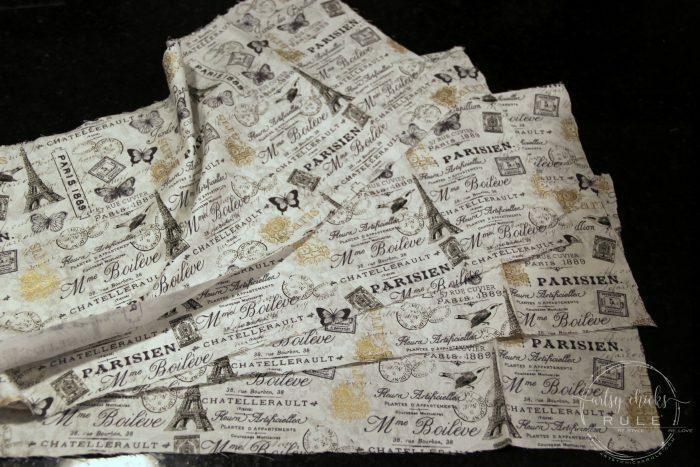 I never did find the fabric I wanted for that one but I did find a sheet set that will work. Yep, a sheet set! Can’t wait to share that one with you. 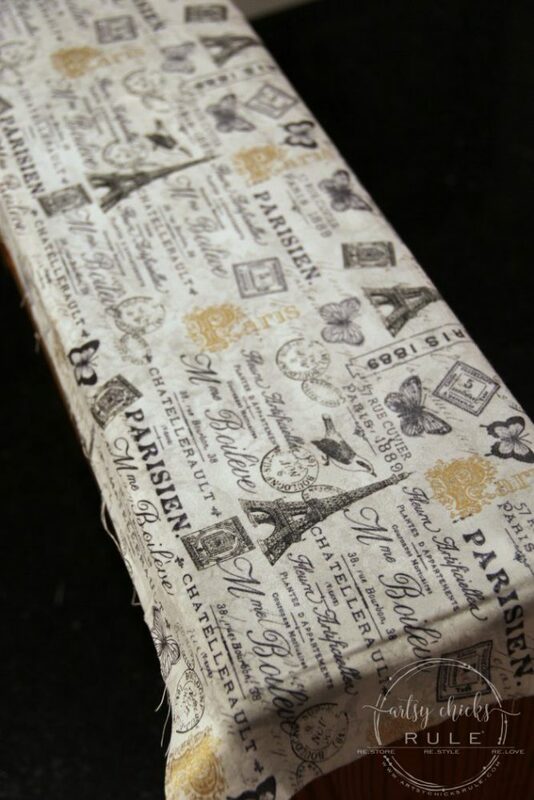 So be on the lookout for another fabric decoupage tutorial soon. I started out by sanding it a bit here and there to even out scratches and such. 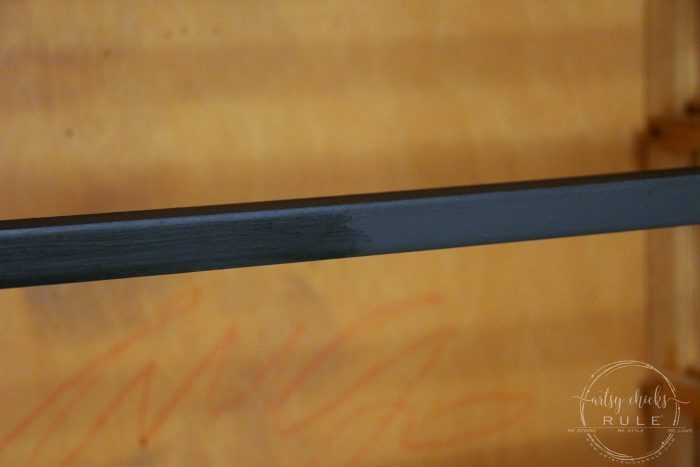 Then it got 2 coats of Graphite Chalk Paint…. I didn’t paint that center area because it’s going to be white. 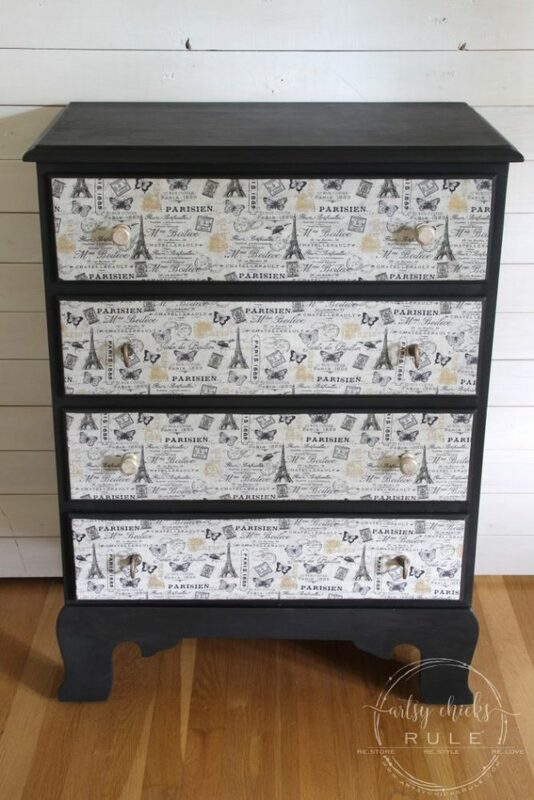 I considered adding stripes here but then remembered this French stencil I had that I thought would be perfect. 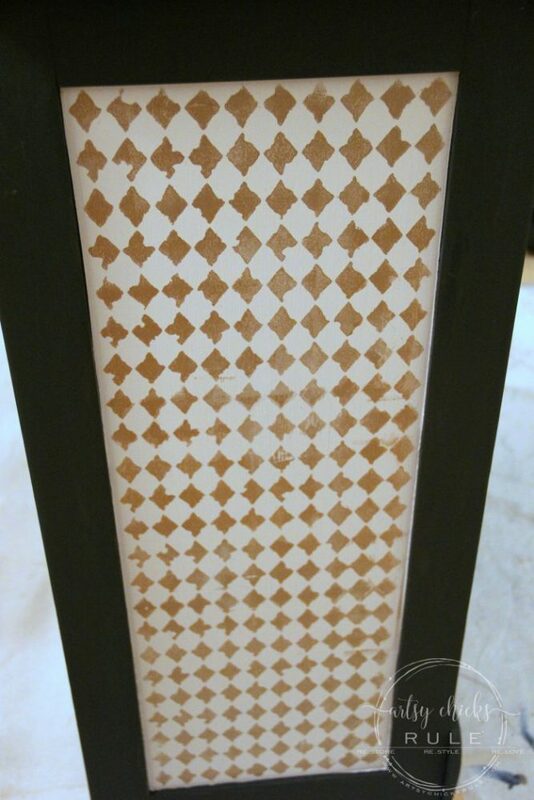 I used this same stencil on this project too. Since the fabric had bits of gold in it, I thought I’d bring some of that gold to the sides. 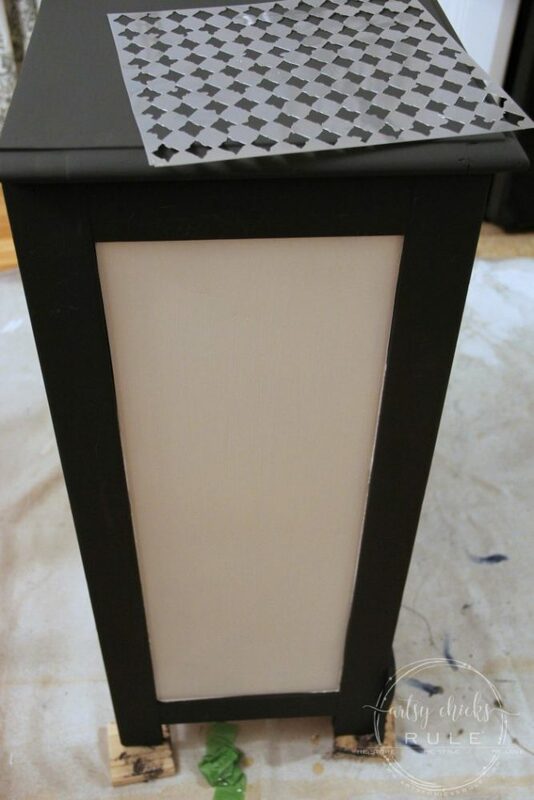 I sanded it to give it more of a blended and distressed look. 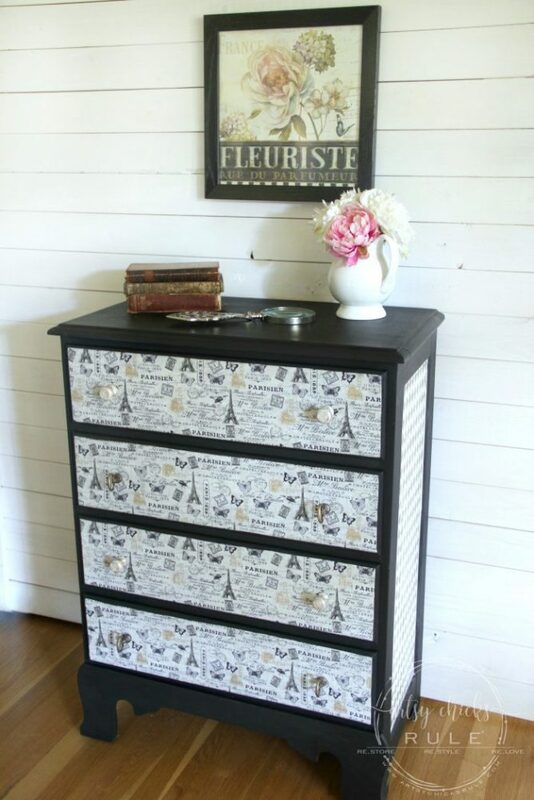 For the fabric front drawers, I was planning to use the same technique that I did on these nightstands fabric decoupage tutorial project I did a couple years ago. 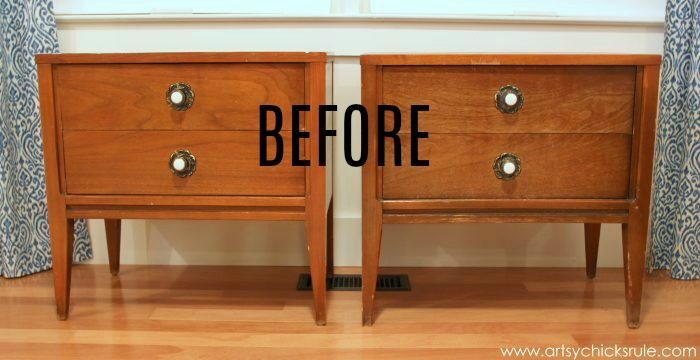 But because of the edges of the drawers I wasn’t going to be able to do it that way. So I used an x-acto knife instead. You can see how those turned out, and that method, here. I started by cutting out pieces of fabric for all 4 drawer fronts that were a little bigger than needed. I removed the hardware from the drawers and filled the holes in the middle. 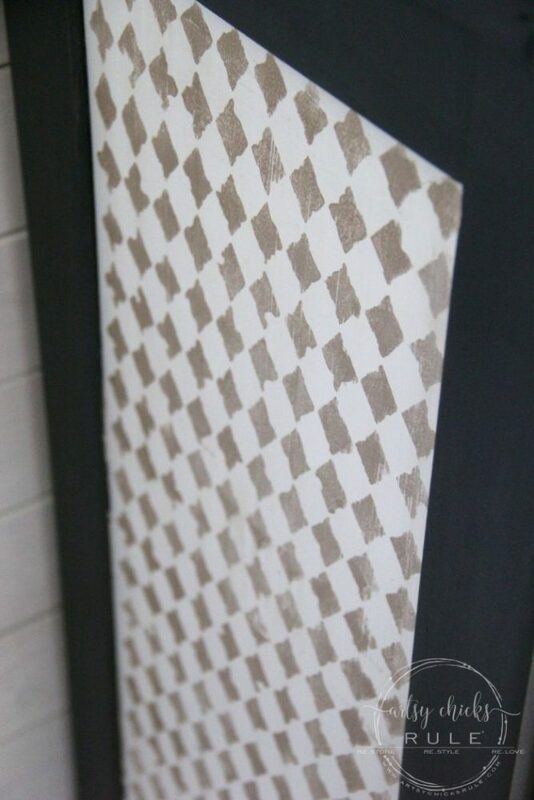 Once that was dry, I then used a chip brush to apply the Mod Podge. You can see above that I decided to only cover the flat area of the drawer with fabric. I thought it would look better, be neater and be a bit easier to attach. I lined up the fabric and pressed firmly making sure there were no lumps or bumps. I used the same chip brush to apply a bit of water on the top to wet the fabric so that the glue would soak in nicely. I went around and lifted the fabric and wiped away any ModPodge that may have gotten on the curved area of the drawer fronts. I didn’t want the fabric to stick there. Once it was dry, I pulled out the x-acto knife and very carefully cut along the line. 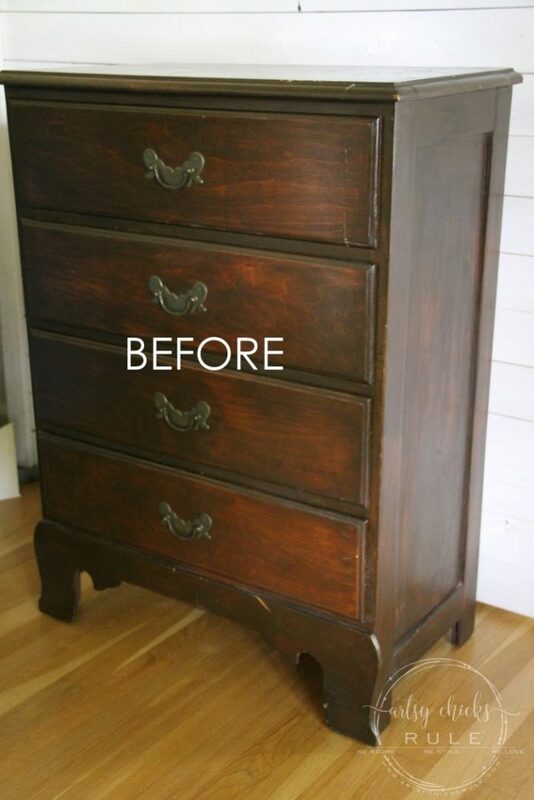 I did this on all 4 drawers and then applied 2 coats of poly, drying in between. 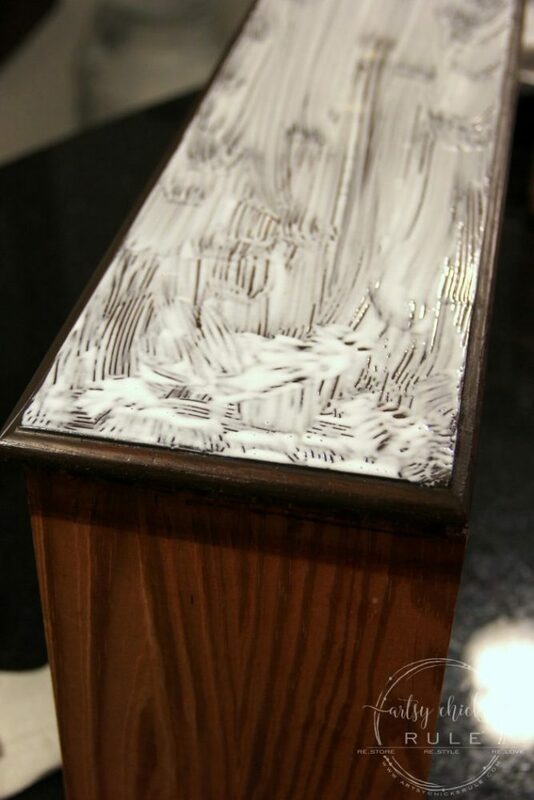 I lightly sanded in between also as the fabric can raise a bit when it gets wet leaving it “bumpy”. I let that sit overnight to get good and dry before I drilled new holes for the new hardware I bought. I picked these up from Hobby Lobby. I wanted to do all 8 in the white/gold knobs but they only had 7. 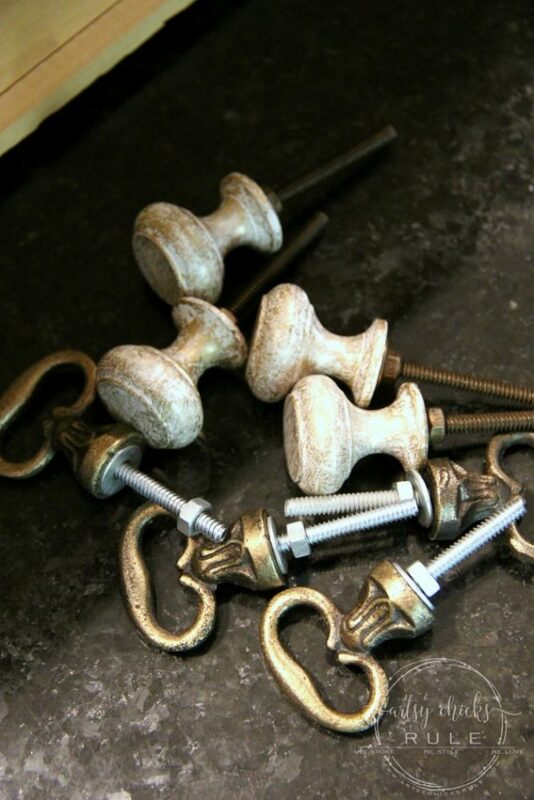 So then I was going to do them all in the gold loop knobs…but they only had 6, haha. But I happened to hit it on 50% off so I was happy! The fabric was also 40% off when I bought it, so that was a plus, too. I added a piece of tape to the areas on the front where the knobs were going. And then measured and marked each drawer. All drilled and knobs added. 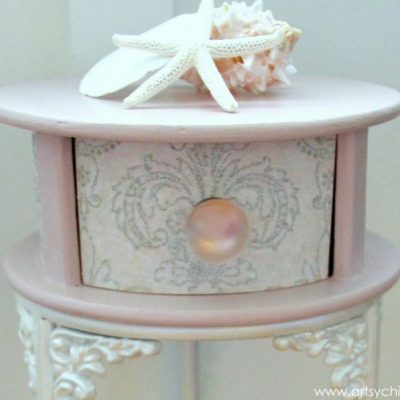 I kinda love the quirky look of different knobs on the same piece of furniture so this worked out okay for me. I did the same thing to this pretty blue chest too. 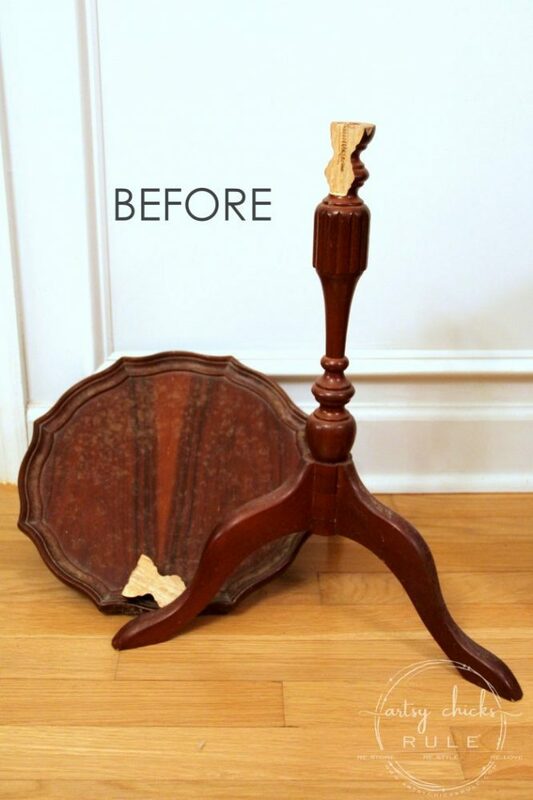 I don’t use wax that often for sealing up furniture anymore. But I did on this one. 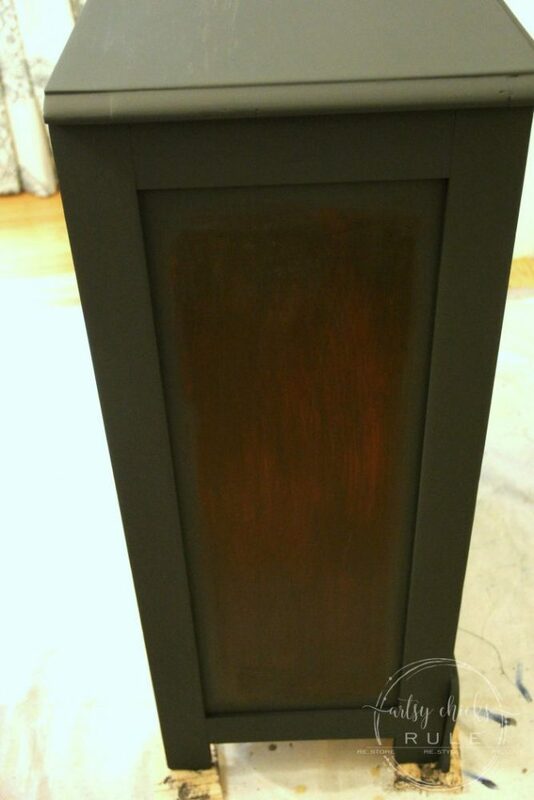 Annie Sloan Black Wax to be exact. 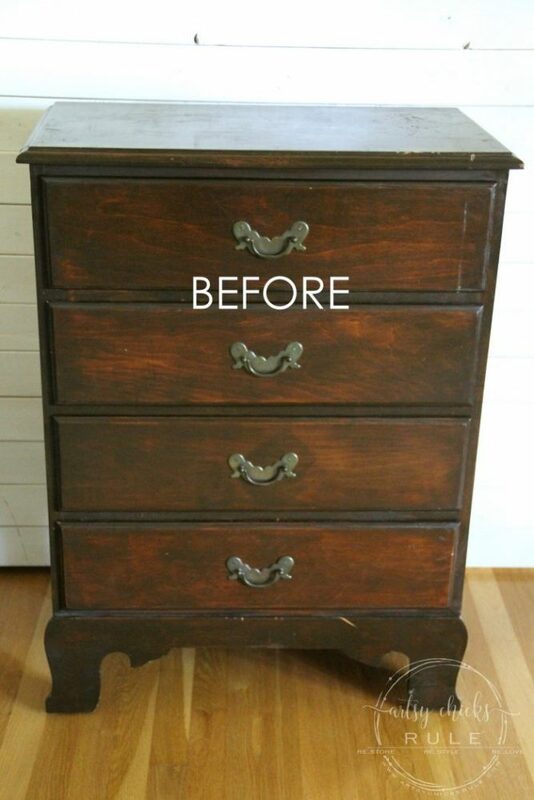 You can see above how it gave the Graphite Chalk Paint just a bit more oomph. The sides where the gold diamonds were got a very lightly dark brown wax tinted clear wax seal coat. Quite a bit different than how it started, huh? I staggered the print and knobs as you can see below. 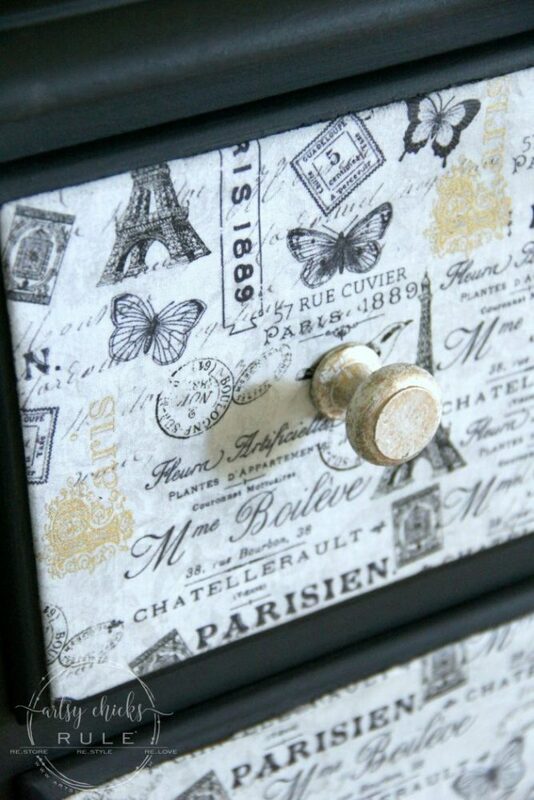 Have you ever used fabric to decoupage? If you haven’t, you should give it a go! There are SO many pretty fabrics out there. And if you are like me and can’t find something you had in mind, try sheets instead. They can end up being cheaper too, depending on what you find. 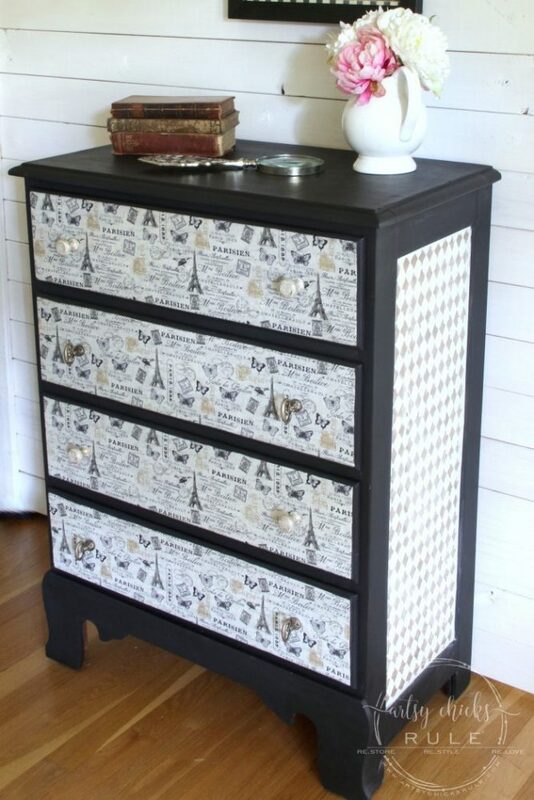 I’d love to see or hear about your fabric decoupage projects too! 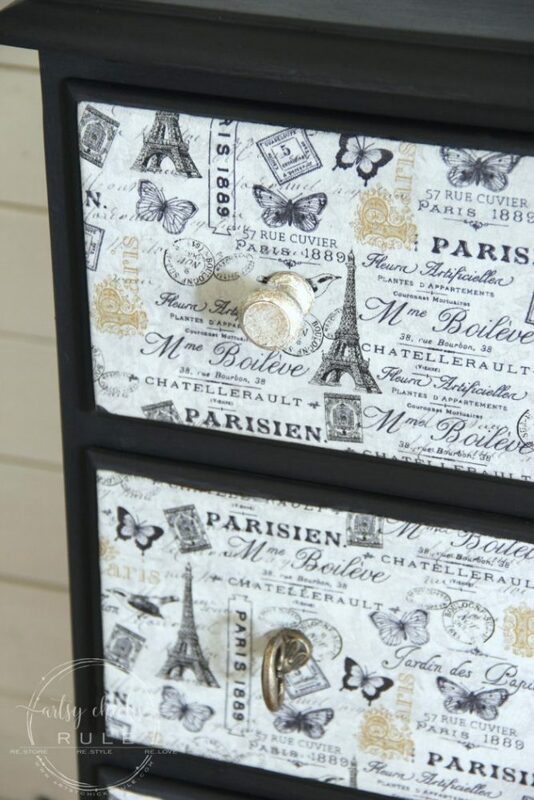 PIN this Fabric Decoupage Tutorial to save it for later! 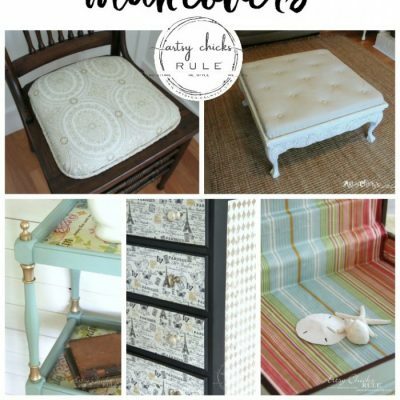 13+ Fun Fabric Projects – For Your Home! hey girl- love the makeover! so cool! Aw I’m sorry Chris! 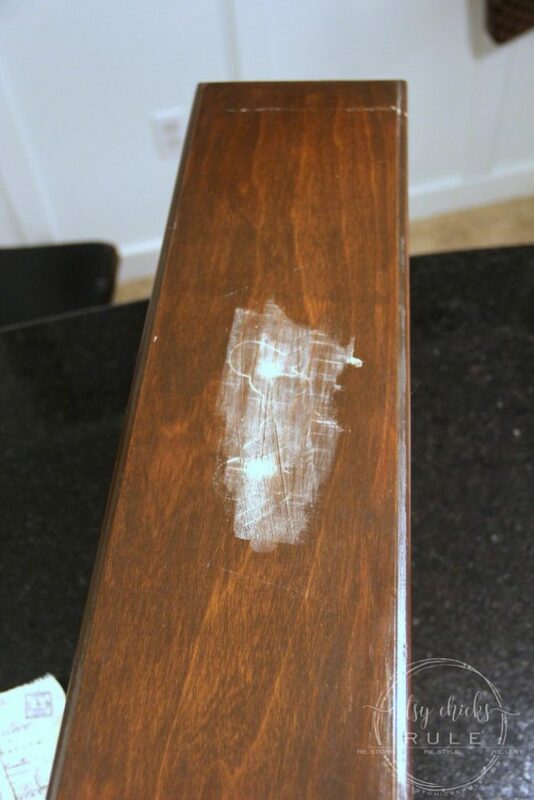 Yes, sometimes wood stain can bleed through but a sealer coat first would help that. I imagine even paint can too depending on what you are working with. 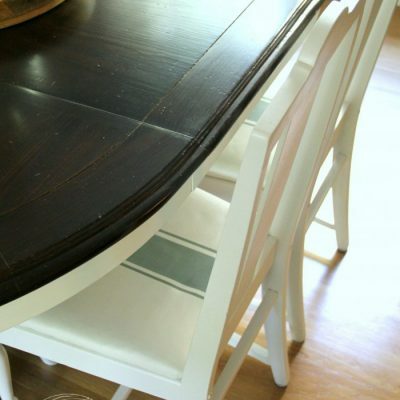 If you have a really dark color and a light color fabric, painting it white first might help with that issue too. The fabric can fray so I try to handle it minimally as I do it. Maybe you could give it another go sometime? 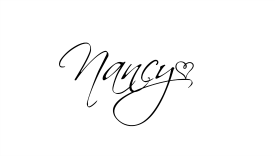 REALLY nice, Nancy… love the gold/black/gray and how it all compliments each other so well.